If you’ve been wanting an augmentation of your chin, but are wary of invasive procedures, non-surgical chin augmentation may be the right option for you. 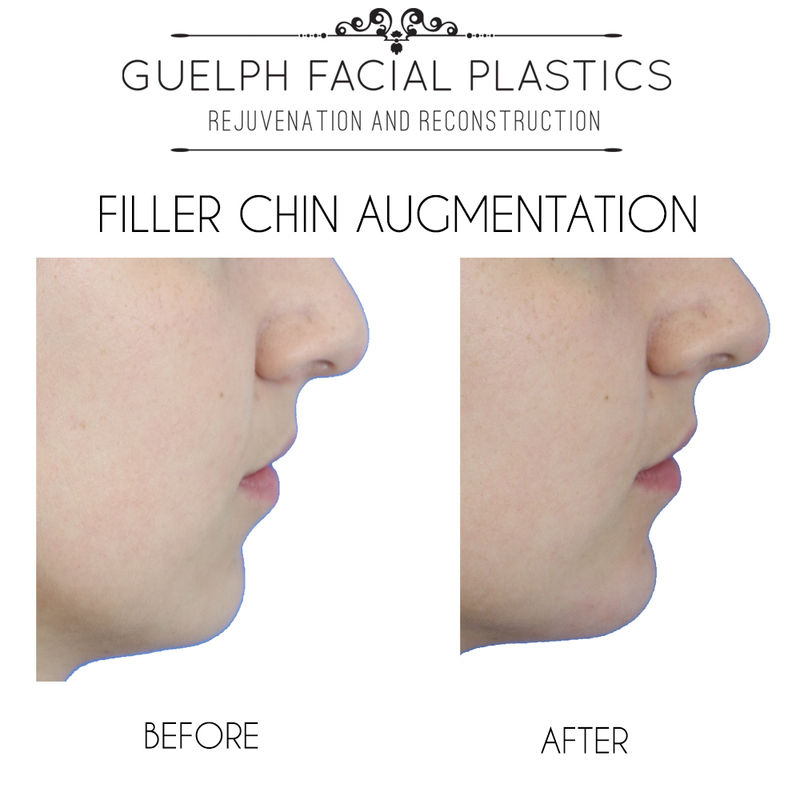 At Guelph Facial Plastics we offer chin augmentation with the use of injectable fillers performed by Dr. Matthew Brace, one of North America’s top Facial Plastic surgeons. Under the care of Dr. Brace and his team, you can achieve a more balanced and proportionate look to your face without surgery. Chin augmentation is a procedure ideal for patients with a small or retrusive chin. Those who have very small chins can greatly benefit from chin augmentation surgery in which an implant is inserted underneath the skin to balance out the lower half of the face. Although this method of facial enhancement is safe and very effective, it requires surgery and some downtime. Surgical chin augmentation usually takes up to two hours to complete and requires a week of downtime to ensure any minor bruising or swelling has been comfortably reduced. If a patient is looking to only slightly alter the shape of their chin, non-surgical chin augmentation may be a better option. In this case, hyaluronic acid fillers like perlane and restylane are carefully injected into the chin area via a needle, to provide volume and balance the proportions of the face. A more ample chin can also add better definition to the profile. Arguably the most enticing aspect of non-surgical chin augmentation is the speed with which it is performed. In just a few minutes (approximately five) Dr. Brace can correct and fill the chin, providing noticeable results without major discomfort or downtime. Post-injection, the skin may be slightly red or swollen, however this subsides in just a few hours. There is no downtime necessary and patients are able to resume their daily schedules immediately after their appointment. Fillers do not offer as permanent of a solution to a disproportioned chin as their surgical counterparts do; however, fillers allow for more flexibility and choice. This versatile procedure is ideal for anyone looking to improve their chin, without the commitment of a surgical operation. For more information about the many options to non-surgical chin augmentation, Book your free consultation with Dr. Brace today.